When you’re visiting Cape Town, South Africa, you absolutely should not miss a side trip to visit some Stellenbosch wineries. This lovely region is just a little over an hour away by car from Cape Town, and it’s one of the best wine tasting trips you can take. As you approach the Stellenbosch Valley, you’ll understand why it’s so important to go there, and if you’ve never tasted Pinotage wines, you’re in for a serious treat. Even if you’re not a wine person, the beauty of this area will stun you. There are palatial wine estates all over the area, along with rolling hills covered with Stellenbosch vineyards. It is part of the experience to cozy up in the tasting room on an overstuffed couch, or even outside on the welcoming patio, with a bottle of wine and spend the afternoon enjoying the wine and the views. They aren’t going to rush you out, or make you stand at the tasting counter, quickly sipping sample after sample that you won’t remember later. The Stellenbosch wine region is one of the most popular, and prestigious, in South Africa. It has a long history of wine growing due to the perfect climate it boasts for grape growing. The hills and valleys provide many distinct micro-climates, so a lot of varietals can flourish, leading to a great diversity in the wine being made there. But it isn’t a pretentious wine area. You can feel comfortable there no matter your level of wine knowledge. In 1924, the Pinotage varietal (a cross between the Pinot Noir and Cinsault grapes) was founded in Stellenbosch. It’s the grape to look out for when wine tasting in Stellenbosch, because it’s unique to South Africa and is the star of the show in the wine making areas of South Africa. Some of the other prominent varietals are Cabernet Sauvignon, Sauvignon Blanc, Shiraz and Chenin Blanc. Another thing we like about the Stellenbosch wine rooms is that you don’t have to go on a guided tour to be able to sample their wines. You also don’t have to have an advanced appointment and can just walk in during open hours for a tasting. Interested in a different wine regions? Check out all our wine tasting articles. You can fairly easily drive yourself around to the wineries in Stellenbosch. Driving there is very easy, because of the good signage and roads. It’s not difficult to find the wineries with a GPS or Google Maps on your phone. We did two different types of tours while we were there, and enjoyed them both. 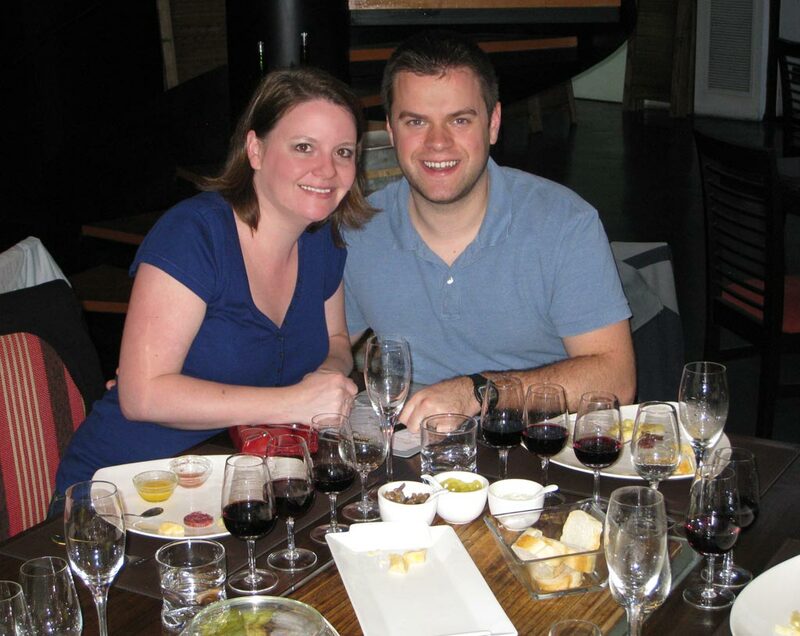 One day we drove ourselves around, and another we took a single-day wine tour with a company. Of course, if you want to actually drink the wine and not spit, it’s best to have a driver. If you’ve gone the route of putting together your own self-guided winery tour, you’ll want to know some of the top wineries to visit. You will quickly find out that there are dozens, so you’ll likely have a to pick a few. These below are wineries that we visited and really enjoyed. Tasting can be enjoyed on the lovely shaded patio or in the wine room. Simonsig is focused on the three generations of the Malan family that have been running the winery for many years. You can read the family’s story when you arrive. A standard tasting includes any six wines from their Cultivar Range, including Kaapse Vonkel and dessert wines, for R50 per person. If you wish, you can add extra wines, or taste their premium or sparking wines too. They also have cellar tours and a restaurant that is open for breakfast, lunch and dinner. They are open for tastings every day of the week starting at 8:30am (11am on Sunday). Check their website for closing hours. Beyerskloof focuses specifically on producing quality Pinotage and Cape Blends. They have a beautiful, modern tasting room where you can sample their diverse wine portfolio. We highly recommend sticking around for lunch in the bistro, if not to try more of their wines that pair very well with food, then for the epxansive views across the rolling Boland vineyards from the outdoor dining patio. There’s always a great experience waiting at Spier Wine Farm. It’s so much more than a winery. They have wine tastings, picnics, tours, and even an Eagle Encounter. On site is a deli, a craft market, a BBQ, and a restaurant. It’s a great place to spend a day. Just know before you go that it isn’t a small winery. It can get really busy. Sit back and enjoy the great views of the Simonberg mountain and the Tokara estate vineyards that spread around the base of it, as you taste through some of Tokara’s great wines. You can also sample their olive oil and brandy. There really isn’t a better location than this. You will feel like you’ve arrived at the most perfect location for wine in the world. Tokara also has a restaurant, perched up on the hillside, that offers stunning views of Stellenbosch and False Bay, along with award-winning food and wine. South Africa’s Stellenbosch Wine Region – Fleur du Cap Wine. I’m a huge fan of salt. I love all varieties of salt. At Die Bergkelder, one of the most prestigious wine cellars in Stellenbosch, there is a salt and wine pairing that I couldn’t pass up on. You may know this, but salty foods are the easiest to pair with wine. They not only lower the acidity and bitterness of wine, but salty foods also make wine smoother and richer. This fun food and wine pairing puts together a few classic combinations of salty foods with the Fleur du Cap unfilterd wines produced at Die Bergkelder. You can also tour the unique underground cellars while you’re there. But be sure to make an appointment in advance, because their tours are very popular. Cape Town is the nearest big city to Stellenbosch and should be the launching point for getting to the region. You can fly into Cape Town International Airport and go from there. There are plenty of easy ways to get to Stellenbosch from Cape Town. By Car: Perhaps the easiest is to rent a car and drive. It’s only 35 minutes from the airport. While you don’t absolutely need a car to get around in Stellenbosch, I can assure you it will be much easier to have your own mode of transportation. Nothing is really within walking distance, unless you stay right in town and only walk to the downtown wineries. Everything else will require transportation. Having a car will provide extra flexibility to visit the stunning estate wineries further afield. By Train: You can also take the train from the city and land pretty much right in the center of town. There are a few tasting rooms within walking distance of the train station. This is a great way to visit Stellenbosch for a day trip. Many organized wine tours will pick you up and drop you back at the train station. Be very careful on public transportation at night! By Bus: A public bus also makes a trip to Stellenbosch, but only once per day. If you’re going from the airport, you’ll first stop in the city center before going on to Stellenbosch. The trip from the city center takes about an hour (longer if you’re coming straight from the airport, due to the stopover). Uber: You have to love that taking an Uber to Stellenbosch cost about the same as taking the bus. It would certainly be my preferred method, next to driving myself. TIP: We like to use GetYourGuide.com to book tours, attractions, and activities online. They have great deals and it’s easy to use! The choice of where to stay in Stellenbosch comes down to whether you want to stay downtown, with easy access to the train station, or if you’d rather stay outside of town, perhaps at one of the many captivating wine estates. We’ve stayed at both and I really prefer staying at a wine estate. It’s a much more immersive experience and the views are unbeatable. 3.5-star hotel, with a great location in the center of town, close to restaurants and shopping. Very nice 4-star hotel on a wine estate with a nice restaurant, free wifi and parking. 4-star wine estate hotel with 2 restaurants, free parking and wifi. Book a wine tasting while you’re there! As far as wine tasting trips go, there is almost not other region in the world that can live up to the standards of Stellenbosch. Even after countless wine tasting trips, it is still one of our very favorite places. This entry was posted in Discover Wine, Wine and tagged south africa.